Salem was once one of the wealthiest cities in the United States. This was due to Salem's role as a seaport and trading center. After the Revolution, America was no longer part of the British Empire and so American traders had to look for new ports and markets. Ships from Salem ranged far and wide, finding new opportunities in Asia commencing the so-called “China Trade.” The ships brought back spices and products from Far East. 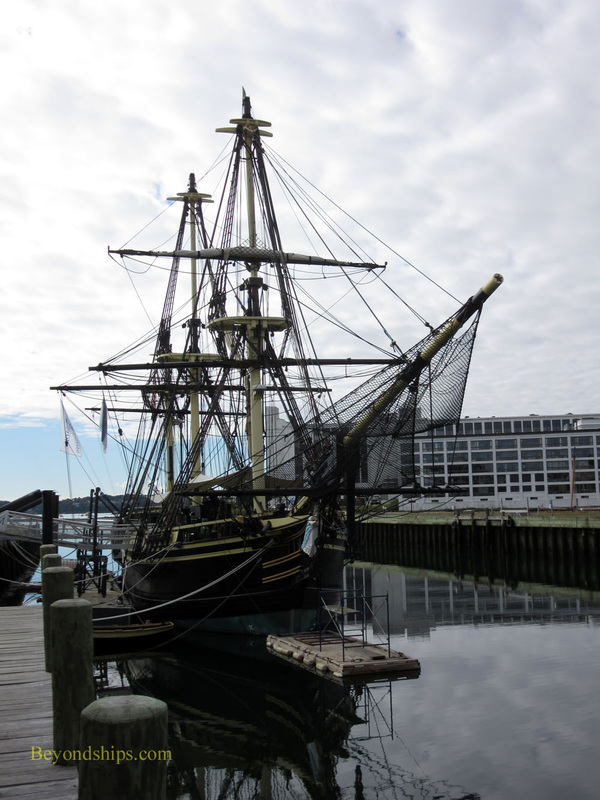 At the same time, ships from Salem were taking codfish to Europe and importing sugar and molasses from the West Indies. The rich merchants who owned these ships built large homes using the then-popular Federal style. Many of these have been preserved and can be seen along Salem's Chestnut Street. It has been called “the most beautiful street in America” and as we drove along it on the tour bus, I could see that this claim was not without basis. 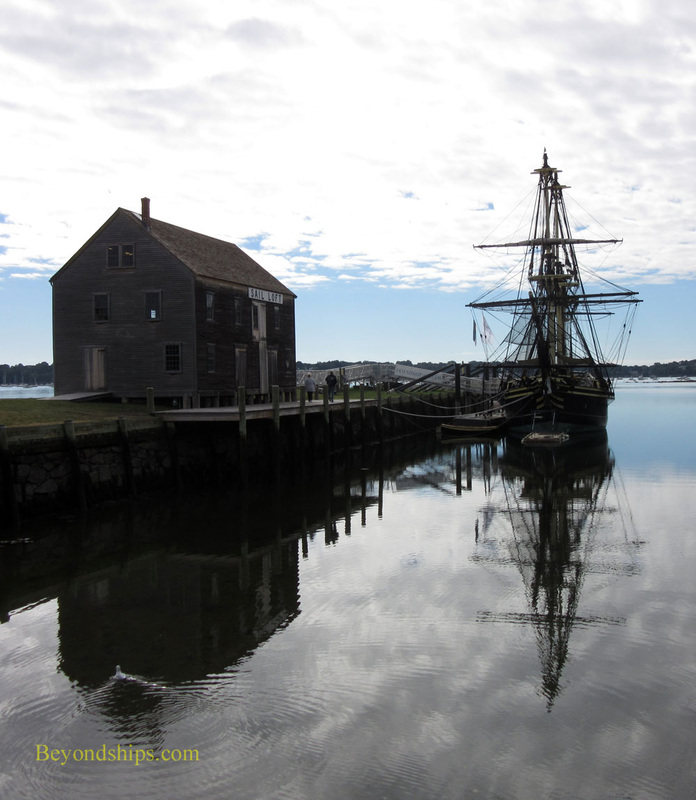 Salem's Golden Age as a major seaport is also reflected in the Salem Maritime National Historic Site. This nine-acre park is dedicated to telling the story of New England's seafaring towns and the importance of international trade to the new nation. The historic site is along the waterfront. Most of it is a grass-covered area surrounding a number of rectangular slips. However, these are actually wharves. In Salem's heyday, they were covered with warehouses and other structures used in connection with the ships that would dock in the slips. Today, the only structure on the wharves is the Pederick Store House. This building originally was a warehouse in Marblehead, which lies across the harbor from Salem. Its lower floor was used to store dried cod that was being exported to England. The upper floor was a sail loft. In 2003, this 18th century building was given to the National Park Service, moved to Salem and reassembled. Berthed next to the Store House is the Site's most outstanding feature, a 175 foot replica of the sailing ship Friendship. The original ship was an East Indiaman merchant ship built in 1797. It sailed to Batavia, India, China, South America, the Caribbean, England, Germany, the Mediterranean, and Russia before being captured by the British during the War of 1812. Today's replica was built by the National Park Service. During the summer, Friendship is open for self-guided tours. 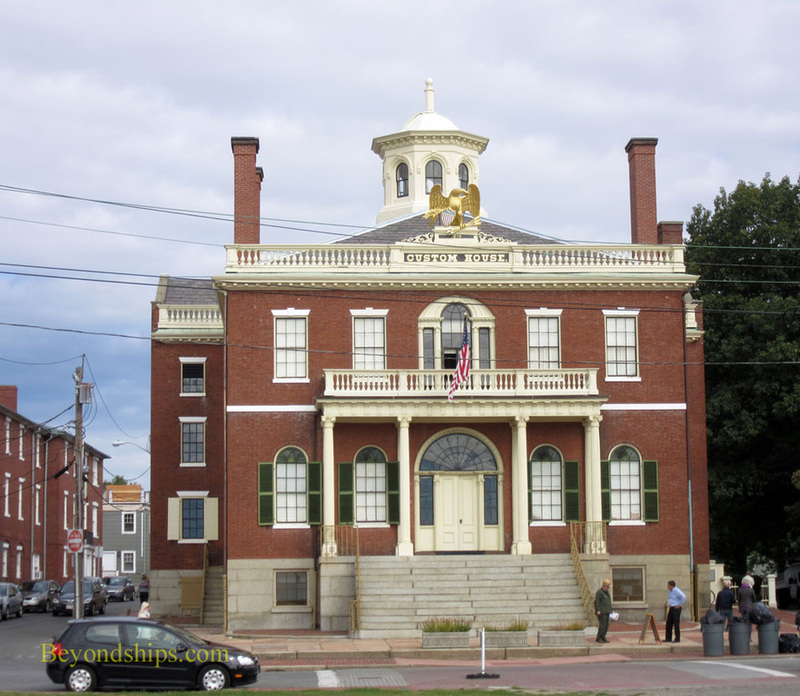 Another attractive feature of the Site is the Custom House built in 1819 for the U.S. Customs Service. In those days, much of the federal government's revenue came from customs levied on cargoes entering the United States. The fine richness of this building underscores the importance of Salem as a seaport. The author Nathaniel Hawthorne, a friend of President Franklin Pierce, worked for the Customs Service in Salem during Pierce's administration. Elsewhere on the Site are the Narbornne House and the Derby House. These were the homes of some of the merchants who sent ships out from Salem. The Narbornne House (1675) is unfurnished and contains archeological exhibits while the Derby House (1762) is furnished in the style that it would have been when the merchants lived there. Both of these houses can only be viewed on the National Park Service tour. There is too much to see at the Salem Maritime Historic Site to do it justice during the brief stop that we made during the shore excursion. The National Park Service recommends allocating between one and three hours for a visit. In sum, this was an educational tour that is particularly worthwhile for those interested in history. 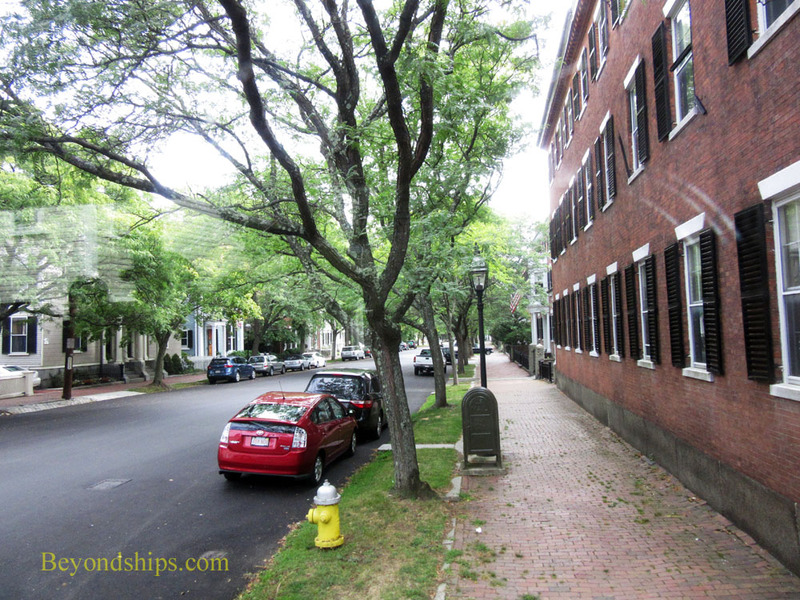 Salem and the surrounding communities are attractive New England towns so there is also enjoyable scenery. 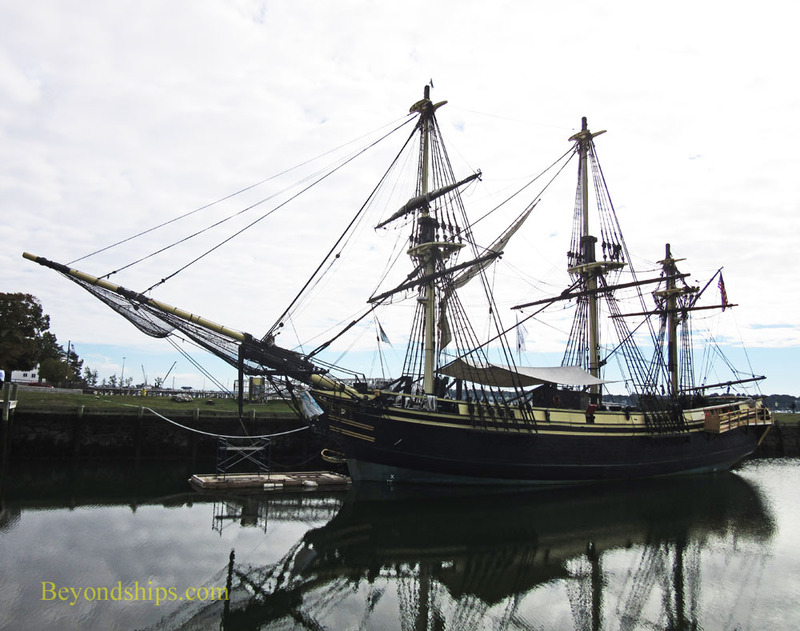 Above and below: The Friendship of Salem. 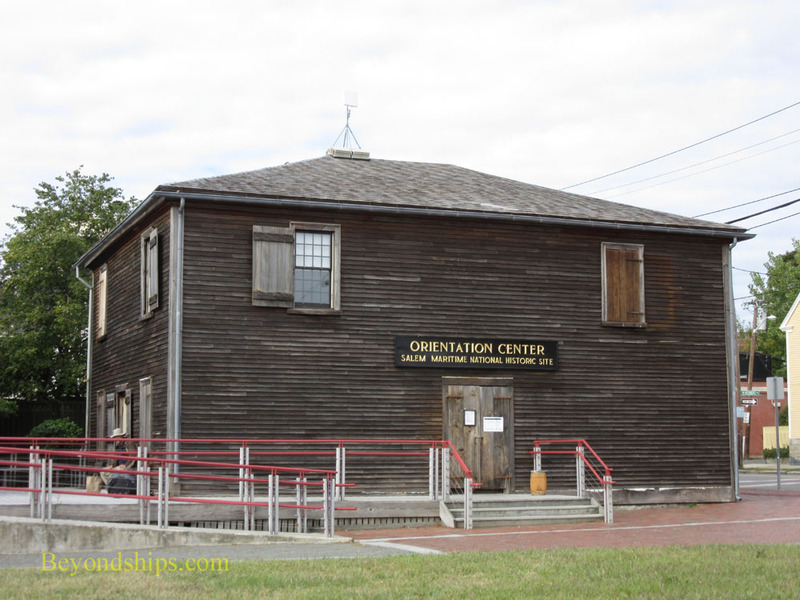 Above: The Salem Historic Site's Orientation Center is a converted early American warehouse.